This year DecisionCAMP was held in Luxembourg Sep 17-19 as a part of the Logic for AI Summit. It became an important event that attracted experts and practitioners in the business decision management from 14 countries. We had 54 official registrations and sometimes even more people were present in the auditorium. The representatives from almost all major BR&DM vendors and many well-known experts attended the event. As the chair of the event, I wrote the Notes from DecisionCAMP-2018 published at the DMCommunity.org blog. A major California bank, facing looming regulatory deadlines, needed to develop a highly dynamic web application to support the bank’s complex customer account management processes. The integrated use of OpenRules’ s rule and rendering engines became the foundation for the successful and quick implementation. OpenRules nominated this real-world application to the first annual Business Rules Excellence Awards (BREA). This success story was selected as a worldwide Finalist in the 2018 Business Rules Excellence Awards. This is a significant achievement for the Bank and OpenRules. The announcement of winning entries will take place on October 16. I also published a paper “Building and Analyzing Goal-Oriented Decision Models” at the Proceedings of the RuleML+RR 2018 Challenge – it explains our goal-oriented approach to decision modeling using a Credit Card Application decision model. 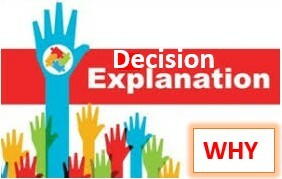 In my closing notes I tried to demonstrate how a smarter decision engine can simplify decision modeling using concrete examples from DMCommunity.org challenges. After considering different decision modeling approaches, we will add these capabilities to standard OpenRules features. This year I am the chair of DecisionCAMP and will give a tutorial “Decision Modeling with DMN and OpenRules” at the co-located RuleML+RR on July 12 at 14:00-15:45. At the BBC-2017 I will present “How Business Analysts Can Build Decision Models with DMN but Without Programming” on Nov 10 at 9:00-10:00. 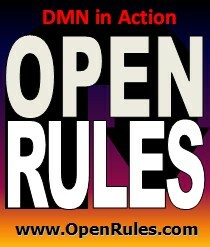 As usual, OpenRules will be a sponsor and an exhibitor – stop at our booth #T8 to see the latest version of OpenRules with “DMN in Action”. This year OpenRules will sponsor the 10th International Web Rule Symposium RuleML that will take place at the Stony Brook University, New York on July 6-9, 2016. RuleML is well-known for building bridges between academia and industry in the field of business rules. Our CTO Dr. Jacob Feldman is a publicity chair of the conference. He is also the organizer of DecisionCAMP-2016 that will be held on July 7-8 at RuleML. This year DecisionCAMP will focus on the new OMG standard “Decision Model and Notation (DMN)” and an emerging best practice. If you attend, you will have a chance to meet face-to-face with many well-known decision management gurus, vendors, and practitioners. I’ve just returned from my first ever trip to Japan. I am coming back home to the US with very bright impressions of the Japanese culture and people. I was especially impressed by the deep respect and high professionalism with which people in Japan perform their jobs independently of how small or important those jobs are. I deeply appreciate the friendliness and readiness to help from people on the streets of Tokyo and Kyoto that I have not seen for a while. 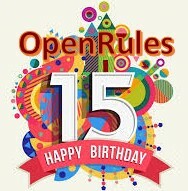 Happy 2013 to all OpenRules customers, colleagues, and friends! The WordPress.com prepared a 2012 annual report for this blog.